Insurance can be confusing. At Maxx Cover Insurance we make general insurance clear and easy to understand. We offer custom designed insurance packages to suit you and your business. Our ultimate focus is to deliver superior quality client service whilst fostering strong, long term relationships. We want to get to know you and your business. We want to help you protect your business. We want to grow and prosper with you. With nearly 40 years in the insurance industry, Rob is a seasoned professional with extensive experience in the insurance industry. He has held senior positions with both insurance and broking companies giving him the expertise to handle all of your insurance requirements. The majority of this time has been working as an insurance broker, servicing the needs of a wide range of professionals, and businesses, not-for-profit and community organisations. Rob is Melbourne-based and has enjoyed stints in London, Sydney and Darwin and conducted training to international broking operations across Australia. Rob joined Insurance Advisernet in 2009. During this time, he has been providing individuals, partnerships, organisations and corporations alike with professional advice on all aspects of insurance. He has expertise across the entire general insurance market, but in particular in Construction Trades, Professional Risks, Retail, Industrial & Commercial Business. 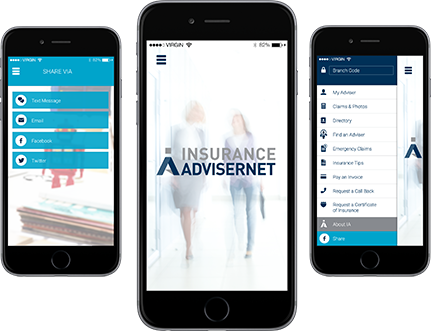 Maxx Cover Insurance Services is an Authorised Representative of Insurance Advisernet, one of Australasia's biggest General Insurance Brokers. Being an Insurance Adviser in Officer our knowledge of the local insurance industry is second to none and our experience in handling insurance for many thousands of customers enables us to provide advice you can always trust. It also means you'll benefit from access to unrivalled financial strength, business efficiencies and buying power spanning every major insurer in Australia and New Zealand even access to major overseas insurers if and when required. We specialise in Business Liability Insurance and Commercial Truck & Motor Insurance as well as a broad range of insurance products. The most common and popular coverage types include general liability, professional liability, product liability, property insurance, worker’s compensation and loss of income. General liability insures your business against third party liability claims from individuals external to the company. Professional liability and malpractice insurance is a more comprehensive option as it insures loss due to negligent professional duty, wrongful acts or ill advice that resulted in losses or personal injury to a third party. Product liability insurance will cover your business against potential lawsuits from faulty products that may have led to damage, illness, injury or death to a person. Property insurance protects your workplace form any losses or damages to your commercial business property as a result of natural occurrences or other incidents. As additional insurance cover is worker’s compensation which will cover your employees in case of illness or injury that occur on your property or whilst conducting a service on behalf of the business. Loss of income will protect you (the business owner) in the case where you are unable to work and not be able to make payments such as rent or employee wages. Business liability is an integral aspect of protecting your business from a range of incidents that are both expected and unexpected. Business liability is an integral aspect of protecting your business from a range of incidents that are both expected and unexpected. Business liability insurance protects your business against third party claims that occur as a result of your business’ operations. Personal injury claims and property damage claims are both financially covered by this option, saving your business from any financial losses. Workers compensation protects your employees if they are injured as a result of their working conditions, covering medical or hospital expenses. In addition, your business is legally protected because once worker’s compensation is agreed upon; the employee forfeits their right to legal action. Commercial motor insurance financially covers any costs regarding business-registered vehicles such as repairs, replacements for stolen vehicles or the loss of vehicle accessories. This particular insurance option is one of the most effective methods of protecting your business flow and avoiding financial loss as a result. In order to avoid any risks associated with commercial trucks and vehicles, an industry specific insurance plan can provide customised protection for your business in almost any situation. Maxx Cover Insurance Services Pty Ltd is a Corporate Authorised Representative of Insurance Advisernet (IA) founded in 1996. IA are a national organisation in both Australia and New Zealand and this allows Maxx Cover Insurance Services Pty Ltd the benefit of maintaining their local presence whilst being able to be part of a national group for products and services needed by their customers in todays complex business world. Thank you for contacting Maxx Cover Insurance Services Pty Ltd! Your message has been sent successfully. One of our skilled Advisers will be in touch with you shortly. A short note to express my thanks to Rob for his continued excellent service and advice regarding the insurance needs for both my business and personal requirements. Rob’s experience and professional manner make it a pleasure to do business with him. The option of splitting our premiums to a monthly payment has been particularly useful in managing our cash flow. Wishing him every success in the future and I will be recommending his services to my colleagues. Big thanks to Rob for doing a great job, I am very happy to recommend him. Insurance is a business necessity; good business insurance advice is even more important. I need advice when I need it, so having someone at the end of a phone or email address is vital to me. Shopping around for quotes and dealing with a call centre is not what I am after. Maxx Cover Insurance Services Pty Ltd is a corporate authorised representative of insurance AdviserNet Australia Pty Limited. Corporate authorised representative number 343021.